Our client built a striking new home on the east slope of Seattle’s Capitol Hill neighborhood. To complement the clean lines of the facade we designed a simple, elegant landscape that sets off the home rather than competing with the bold architecture. Soft grasses offer contrast to the natural stone veneer, perennials brighten the mood, and planters add a bit of whimsy to the arrival sequence. On either side of the main entry, roof runoff is dramatically routed down the face of the home in steel troughs to biofilter planters faced in stone. Around the back of the home, a small “leftover” space was transformed into a cozy patio terrace with bluestone slabs and crushed granite underfoot. A view down into, or across the back patio area provides a serene foreground to the beautiful views to Lake Washington beyond. Collaborating with Thielsen Architects provided the owners with a sold design team--working together with one voice to build their dream home. 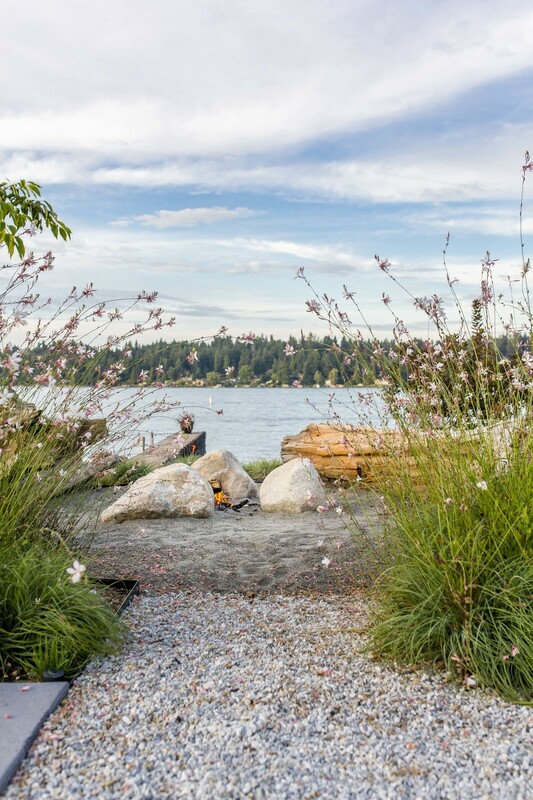 A Mercer Island couple wanted to transform and upgrade the usability of their waterfront landscape. A large, mushy lawn with no walkway to the dock or the water isolated the house from the waterfront. The owners, having lived in both California and Cape Cod, wanted a beach-like feel to the new landscape, better access to the water, and more amenities. Project Groundwork transformed the waterfront by adding large concrete slabs and stairs to provide hard-surface circulation to a new sandy beach, complete with salvaged, cedar logs around a deconstructed wood-burning firepit, invigorating the space and creating a place to relax and entertain right on the water. Closer to the house, an ipe deck built around a new Paloform gas firepit created a new outdoor room. for enjoying endless summer evenings. 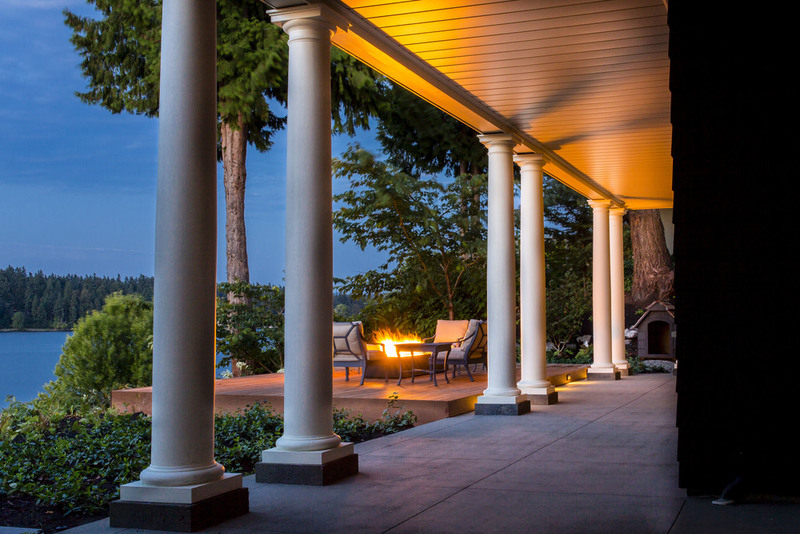 A large deck overhead was covered underneath and rain-proofed, allowing more light into the lower floor rooms and brightening the look and feel of the already beautiful home. LED landscape lighting completes the improvements. Shoreline restoration is the ultimate combination of art and science. Get either wrong, and you’ve got an unhappy clients and unhappy regulators! 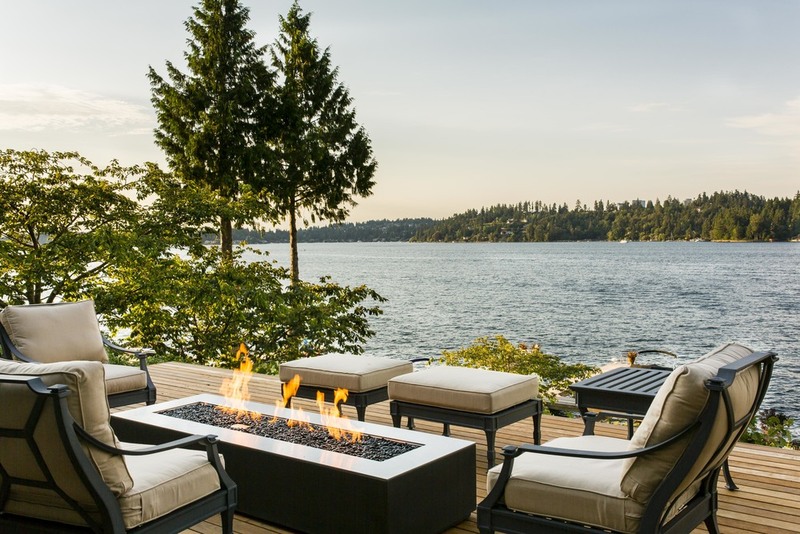 For this Madison Park project on Lake Washington, our client wanted to remove an outdated, dilapidated and ugly bulkhead. Small gardens benefit from shorter timelines and attention to detail that is sometimes lost on larger landscapes. With this particular client, the design was very collaborative, with our designers providing guidance and ideas while working on the layout together. Working from concept to installation took only four months! We’re excited to see this garden grow and evolve as the plants mature and grow together to form drifts and soften the edges of the spaces.